A recent report suggests that the Rohingya could become the target of further mass atrocities. A recent report by the United States Holocaust Memorial Museum concludes that conditions are ripe for genocide in Myanmar. Staff from the museum’s Simon-Skjodt Center for the Prevention of Genocide traveled to Myanmar, also known as Burma, in March to investigate threats facing the Rohingya, a Muslim minority group which has been subject to massive discrimination. They concluded that the population was at grave risk of additional mass atrocities and even genocide. 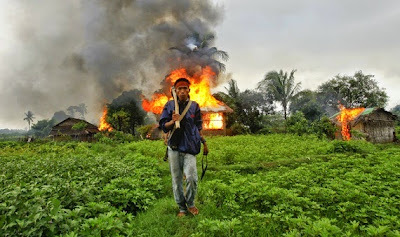 “We left Burma [Myanmar] deeply concerned that so many preconditions for genocide are already in place. With a recent history of mass atrocities and within a pervasive climate of hatred and fear, the Rohingya may once again become the target of mass atrocities, including genocide,” the group said. The starkest early warning signs of future mass atrocities, the group said, included various acts targeting the Rohingya such as physical violence against individuals, homes and businesses; physical segregation from other ethnic groups; rampant and unchecked hate speech; destruction of mosques; and sexual violence. This is not the first time that stark assessment has been made. Observers have issued several warnings of this sort in recent years – with labels including “potential genocide”; “slow-burning genocide”; and “hidden genocide” – while current conditions have been referred to as ethnic cleansing. Some groups such as Genocide Watch and the United Nations have their own frameworks to more clearly define the risks of genocide. Myanmar goes to the polls at the end of this year and the report ominously notes that the situation is so untenable that the upcoming elections could serve as a spark that ignites mass violence. “Such a spark could be the national elections planned for the fall of 2015. Elections are sometimes trigger points for increased violence, especially in places marked by past violence and long-term oppression,” it warned. Addressing these early warning signs, the group concluded, requires long-term strategies to counter hate and build resiliency. It advised the government in Myanmar to take various steps including ending all discriminatory laws and policies targeting the Rohingya; investigating attacks committed against the group in accordance with internationally recognized legal standards; and fully cooperating and assisting humanitarian aid organizations, governments and other agencies trying to assist the minority group. It called on the international community to establish an office of the United Nations High Commissioner for Human Rights in Myanmar and to be prepared to introduce a new UN sanctions regime targeting funders and organizers of anti-Rohingya and anti-Muslim violence.